Are you ready for a ‘Fashion Night Out’? 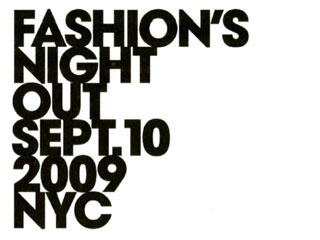 The world is having a fashion pep rally and it’s called Fashion’s Night Out! The people at American Vogue has linked arms with NYC & Company, the City of New York, and the Council of Fashion Designers to help boost the retail morale and to celebrate (if not, restore) consumer confidence. The event includes is reaching all corners of the globe: New York City, United Kingdom, Taiwan, Italy, France, Brazil, Greece, India, Spain, and, of course, San Francisco. WHO: In addition to a heightened Neiman Marcus shopping experience, graduates and current students are teaming up with the luxe store for beading, textile and knitting demonstrations. The School of Fashion’s Executive Director and illustrator extraordinaire, Gladys Perint Palmer will also showcase her latest couture illustrations from Paris Fashion Week (check out her website for a taste of what you will see). For more info on the global fashion extravaganza, visit the Fashion’s Night Out website.